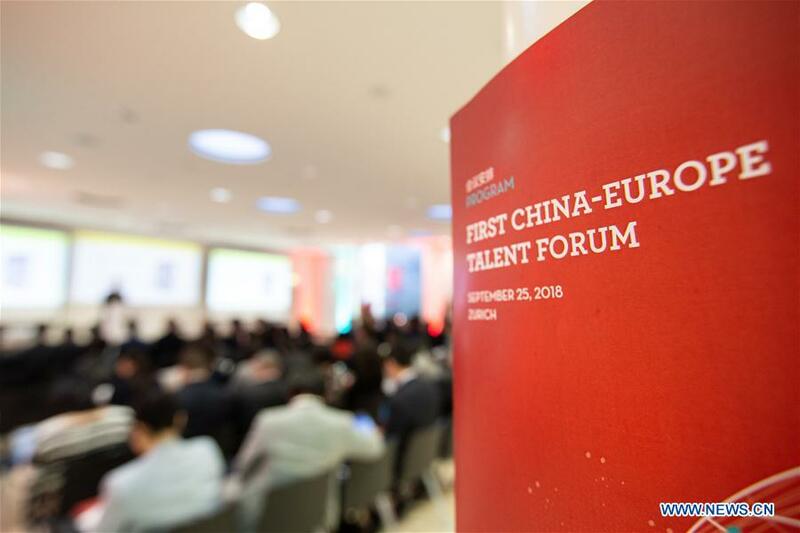 ZURICH, Switzerland, Sept. 25 (Xinhua) -- The first China-Europe Talent Forum was jointly hosted in Zurich, Switzerland, on Tuesday by the Chinese embassy in Switzerland and the Swiss Adecco Group. The forum gathered more than 100 senior executives from over 40 Chinese and European companies to exchange their views on three topics: European labor market and its laws and regulations, international talent acquisition, and staff management and training. Geng Wenbing, Chinese ambassador to Switzerland, said at the forum that since the beginning of the 21st century, talent has become the key factor for the development of all countries and business. After 40 years of reform and opening up, China's economy, now shifting from high-speed growth to high-quality development, is at a key phase of changing patterns, optimizing economic structure, and transforming growth momentum. An economy driven by innovation is, after all, one driven by talent, which is why the Chinese market has a huge demand for high-level talents, Geng said. He added that the Chinese government has always attached great importance to the work related to talent, including the international cooperation in this field. China and Europe are the world's two major economies, showing a broad prospect for cooperation in the area. The forum aims to promote the exchange and integration of all talent by building an open, pragmatic and future-oriented Sino-European talent exchange platform that will help Chinese enterprises operating in Europe actively participate in international cooperation, the ambassador concluded. Rolf Dorig, chair of the board of directors of the Adecco Group, said as the economic relations between China and Europe are developing constantly and the global work changing rapidly, talent is now the currency of success, and is ever more valuable, but also ever more scarce. The forum, he added, thus offers a platform to share experience, build cooperation, promote talent exchange and enhance companies' competitiveness. It also demonstrates the shared commitment, from both Chinese companies and the Adecco Group, to build bridges and help each other proper.